The UFC has had some of the greatest athletes the world has ever seen. Anderson “The Spider” Silva reigned as the middleweight champion for six straight years while posting 16 straight wins, a UFC record according to Fight Matrix.com. We’ve seen Jon “Bones” Jones completely dominate his opponents and become the youngest champion in UFC history. Before her first defeat, Ronda Rousey was nearly untouchable, winning 12 straight fights, 11 of them not going past the first round as stated by Huffington Post editor Peter Andrew Hart. Even with all of these superstar athletes, though, none of them come close to Conor McGregor. McGregor’s popularity has gone so far that it has spanned to the boxing world. He has been involved in several verbal spats with retired megastar Floyd Mayweather Jr. regarding who would win a boxing match between the two. On December 3, McGregor obtained a boxing license in California to make the possible dream bout even more realistic. However, neither the outspoken former boxer nor his team has given serious consideration to making the bout happen. “He’s a very good MMA fighter, give credit where it’s due. It’s kind of played out now. Just stop it. The con game is over. Go out there and worry about dominating the UFC because three fights ago he lost, he was quitting. You couldn’t even mention the word quit with Floyd Mayweather,” said CEO of Mayweather Promotions Leonard Ellerbe told ESPN on December 1. Give credit to McGregor for trying to expand his brand even further, willing to go toe to toe with one of the best boxers of all time. McGregor is in a different stratosphere due to his talent and his attitude. Throughout his career, McGregor has 21 wins, 18 coming from TKO. He is an elite striker with speed the likes we’ve never seen before. His most shocking victory came against former UFC featherweight champion Jose Aldo where he knocked him out in 13 seconds with a left jab. Aldo was 14-0 before his encounter with McGregor. Knocking Aldo out in 13 seconds wasn’t even McGregor’s greatest feat. His greatest accomplishment came November 12, 2016 when he stopped Eddie Alvarez via TKO to become the first two-division champion in UFC history. McGregor wasn’t really challenged throughout the fight and even dropped his hands a few times to taunt Alvarez. Alvarez was completely outclassed as most of McGregor’s opponents are and McGregor knew it from the start. Besides McGregor’s physical talents, what makes him so unique? The determining factor is his persona as evidenced by his back and forth with Mayweather. He has a level of arrogance that sits well with some and not so well with others. No matter what people think about him, McGregor is going to say what is on his mind. After winning his second UFC title, McGregor made yet another controversial statement. 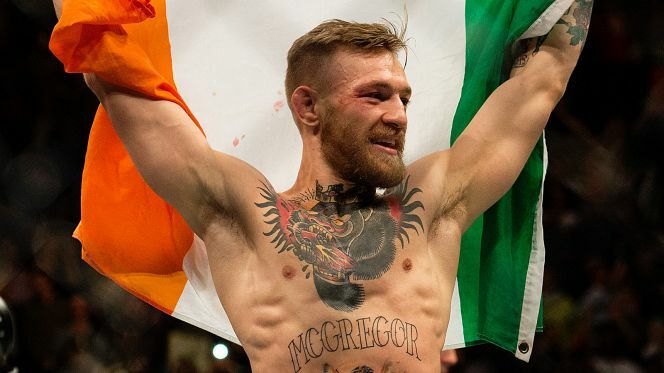 In an interview immediately after the fight, McGregor stated “I need to be set for life for this. If you want me to be truly on board, then I need to be all-in on this proper, as an owner, and have an equity stake in the company. That’s what I’m looking for” according to MMA Fighting writer Dave Doyle. McGregor may step outside of his boundaries at times, but it gives him unparalleled amounts of attention that the UFC has never seen before. McGregor is going to be the face of the UFC for many years to come and will continue to help the UFC become one of the most popular sports in the world. Many will speculate what the outcome of a McGregor-Mayweather superfight would be but, as of right now, it seems that the only time these two will be in a ring together is on a video game. Jordan Grice ’15, It’s all about that sports section baby!